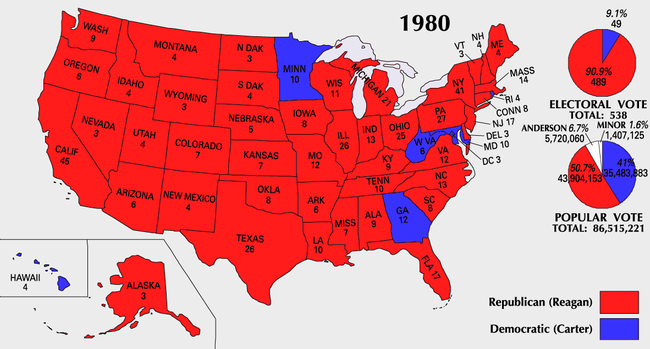 Reagan won the election by a landslide, taking a large majority of the electoral vote and 50.7% of the popular vote. 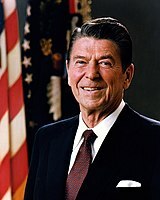 Reagan received the highest number of electoral votes ever won by a non-incumbent presidential candidate. In the simultaneous Congressional elections, Republicans won control of the United States Senate for the first time since 1955. 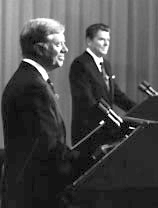 Carter won 41% of the vote but carried just six states and Washington, D.C. Anderson won 6.6% of the popular vote, and he performed best among liberal Republican voters dissatisfied with Reagan. Reagan, then 69, was the oldest person to ever be elected president until Donald Trump's victory in 2016, at 70. Trump was a year older than Reagan, then. ^ "Voter Turnout in Presidential Elections". Presidency.ucsb.edu. Retrieved August 18, 2016. ^ a b "Oil Squeeze". Time magazine. 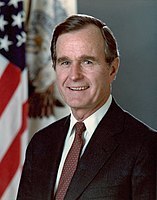 February 5, 1979. Archived from the original on March 7, 2008. Retrieved December 18, 2013. ^ "Inflation-proofing". ConsumerReports.org. February 11, 2010. Retrieved December 18, 2013. ^ Allis, Sam (February 18, 2009). "Chapter 4: Sailing Into the Wind: Losing a quest for the top, finding a new freedom". The Boston Globe. Retrieved March 10, 2009. ^ Marra, Robin F.; Ostrom, Charles W.; Simon, Dennis M. (January 1, 1990). "Foreign Policy and Presidential Popularity: Creating Windows of Opportunity in the Perpetual Election". The Journal of Conflict Resolution. 34 (4): 588–623. JSTOR 174181. ^ "Chapter 3 : The Iranian Hostage Rescue Mission" (PDF). Press.umich.edu. Retrieved August 18, 2016. ^ Robbins, James S. (May 13, 2008). "Clinton Campaign Reminiscent of 1980 Race". CBS News. Retrieved August 18, 2016. ^ Moore, John (December 16, 2013). Elections A-Z. Routledge. ISBN 9781135938703. ^ "CPD: 1980 Debates". www.debates.org. Retrieved January 8, 2019. ^ "Fred Barnes on Conversations with Bill Kristol". Conversationswithbillkristol.org. Retrieved August 18, 2016. ^ Inc., Gallup,. "Late Upsets Are Rare, but Have Happened". Retrieved August 25, 2016. ^ "Voters the choice is yours". St. Petersburg Times. November 4, 1980. Retrieved January 16, 2014. 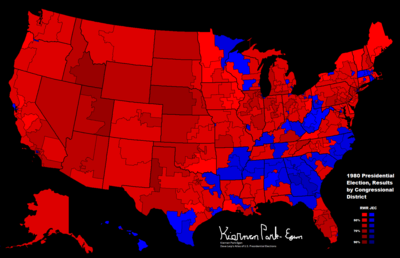 ^ "Reagan in a landslide". Pittsburgh Post-Gazette. November 5, 1980. Retrieved January 16, 2014. 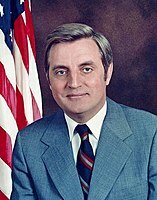 ^ Anderson, John B. (September 28, 2007). "Let the most popular candidate win". Christian Science Monitor. ISSN 0882-7729. Retrieved September 1, 2017. ^ Kornacki, Steve (April 4, 2011). "The myths that just won't die". Salon. Retrieved August 1, 2017.